How can I successfully install the update? You may see a message that the database is out of date. If so, click on the Fix button in the toolbar. I also had the same error message after upgrading 3.6.0 -> 3.6.1: 0 Failed to start the session: already started by PHP ($_SESSION is set). To resolve, you need to use PHP Selector and change from 5.3 (it's a PHP 5.3 issue; will be fixed in Joomla 3.6.2). I change from 5.3 --> 5.6 and am now able to login the administration. From the sites I have patched today, this seems to be a PHP 5.3 issue. Update the Joomla! Update Component through the Extension Manager. Then use the Joomla! Update component to update to the latest 3.6.x version. I have updated that one first, and then went back to Joomla Update component and clicked on that blue button 'Install the update', this time without any problems or error messages. 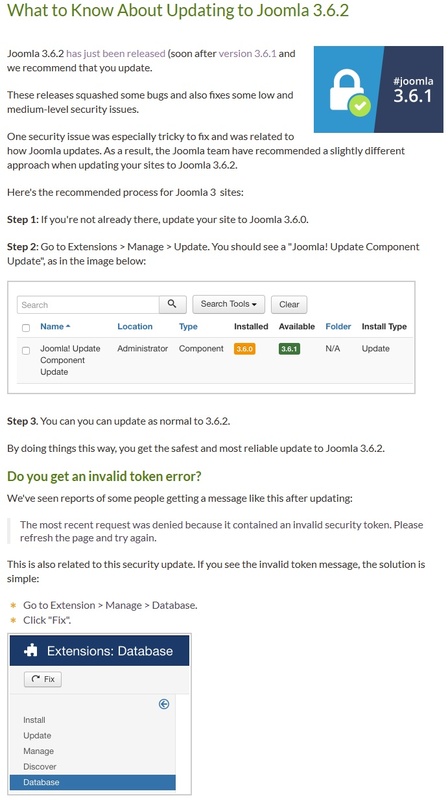 There are also download links to all important packages in questions, even to that Joomla Update Component update itself com_joomlaupdate-3.6.1.zip, just in case that for some reason that update doesn't appear in your Extensions Update component on your site. Moral of the story: RTFM! Not the answer you're looking for? Browse other questions tagged joomla-3.x update one-click-updates joomla-3.6 or ask your own question.